Why the marquetry shack? because this is where I do all my work! My name is Ian Smith, based in Manchester, UK, and I create bespoke marquetry pictures from photographs, art work, or your or my own designs. Every picture is unique, taking advantage of the wonderful tones and contrasts that can only be achieved through natural wood veneers. 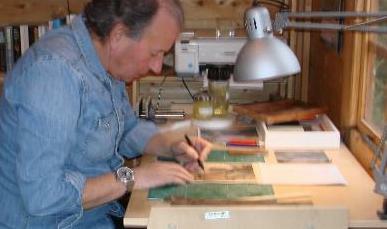 All my work is produced using traditional hand cutting methods (the "window" technique). I do not use a laser as the work I do specialises in hand production. I have hundreds of veneers and I see the art of marquetry as using the natural grain of wood and the tones it can create. I am responsible for the whole artistic process from design, choice of veneers and cutting. I then hand over to professional layers and finishers to complete the process, allowing me more time for the creative work, and ensuring a world class finish - first from Sean at http://www.veneeringsolutionsltd.co.uk then over to Tim at http://www.totalwoodfinishing.co.uk These guys are the best! Some of the pictures in my gallery are over thirty years old and unlike me they improve with age! "We recently acquired some marquetry crafted by Ian Smith. The subject is taken from the painting 'A Young Man at his Window' by the French impressionist Gustave Caillebotte. We are delighted to own such a skilful piece which is exceptionally well crafted and beautifully finished" -- Ray and Brenda Stokes, Perth, Western Australia. "Ian Smith crafts marquetry to a most exquisite level. The delicate finish and artistic blend of colours and natural grain give depth and movement to his intricate pictures. The result is lifelike, emotive and nothing short of breathtaking. Most definitely the best marquetry I have come across." -- Mirriam Lawton, Lancashire, England. "Marquetry Shack Brilliance! I commissioned Ian to produce a marquetry replication of a photograph from Australia. The journey was a joy from the start. I am still amazed at the likeness of me and my guitar resulting. The attention to detail and skill of matching veneer colours and textures to the image has produced a unique and wonderful work of art; a one of a kind. I highly recommend the Marquetry Shack and Ian as a world class artisan. In a world full of mass produced and quickly replicated produce, Ian’s work is something to behold. Highly recommended." Rowan, Australia. I am also on twitter but refuse to use it as long as Donald Trump is on there!